Kids need a dedicated space to do their homework, whether it's in their rooms, a common room in the house, or at the dinner table. But if it seems like your kids find any excuse not to sit down and do their homework, it could be their workstation is lacking in the right light, the right inspiration, or even the right chair. These quick and easy fixes will get your kids to focus on their homework—and ensure it gets done. Now that you know why your kids need a dedicated homework station, read on as Annie Draddy, a professional organizer and co-founder of Henry & Higby, a professional organizing company in New York City, shares 10 ways to get your kids to actually sit down and get their work done—plus products that will help enhance their space. We promise that your kids will thank you later! Select a good desk chair. The goal here: to select a desk chair that’s as comfortable as it is supportive. “You don’t want a lousy chair to be the reason that your kids are doing their homework in front of the TV,” Draddy says. Make it easy to keep a shipshape desk. Although it may seem obvious, keeping a trash or recycling can near your child’s desk is a win-win. “Not only will this encourage him to throw out old papers, but also—perhaps with a little coaxing—purge the garbage from his backpack on a regular basis,” Draddy says. Bonus points if you encourage your child to routinely empty that trash on her own as part of her chores. It’s time to dust off your label maker and use it to help your kids stay organized. “Label everything on your supply containers/caddy,” Draddy says, adding that this includes recent tests, papers, and assignment sheets as well as bins containing supplies. 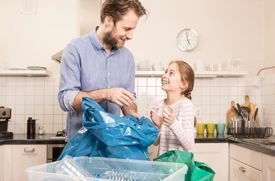 “This will help teach your children how to maintain their space and hopefully put an end to the continuing cycle of them asking where to put their supplies when they are done with their homework,” Draddy adds. As your kids get older, homework will often require the use of technology, whether that’s a laptop, iPad, or other plug-ins, all of which means cord and charging chaos. “Keep your kids’ homework space tidy from the cord clutter by using some of those ingenious products and hacks to help cables stay neat and handy for when it’s time to plug in and charge,” Draddy says. Color-coded file folders can be vital to keeping organized. Encourage your child to stow all science papers in a green folder, English compositions in their blue folder, French worksheets in a red folder, and so on. “This helps kids keep their notes organized whether on their desk or in their book bag,” Draddy says. Behold the power of the in-box. With school comes tons of assignments and papers that need to stay organized. “Consider setting up an ‘in’ and ‘out’ bin where your kids can put assignments that need to be done and others that are already completed,” Draddy says. “This makes it easier to remember that everything in the ‘out’ bin needs to be packed in their backpacks and returned to school the next day.” For papers your kids want to keep for future nostalgia, consider keeping these in bins. By doing this, your house will stay streamlined too. RELATED: How Much Should You Help Your Child with Homework?